Scallops are so easy and delicious to make; taking very little time to cook for a fantastic quick dinner. I used a grille pan to sear my scallops; my personal favorite is Le Creuset. You can use a regular pan. I soaked the scallops in lemon juice and garlic for a hint of a lemony garlic flavor. Rinse scallops with cold water and thoroughly pat dry. Place in bowl and pour lemon juice over scallops. Add garlic.Let set for minutes then drain discarding the lemon juice and garlic. Pat dry again. Add the butter and oil to a 12 to 14-inch saute pan or ridged grill pan on high heat. Salt and pepper the scallops. Once the fat begins to smoke, gently add the scallops, making sure they are not touching each other. Sear the scallops for 2 minutes on each side. The scallops should have a 1/4-inch golden crust on each side while still being translucent in the center. Serve immediately. I love the french recipe Coques St. Jacques which I bake and serve in beautiful scallop shells. The traditional recipe has many steps and requires time to make. 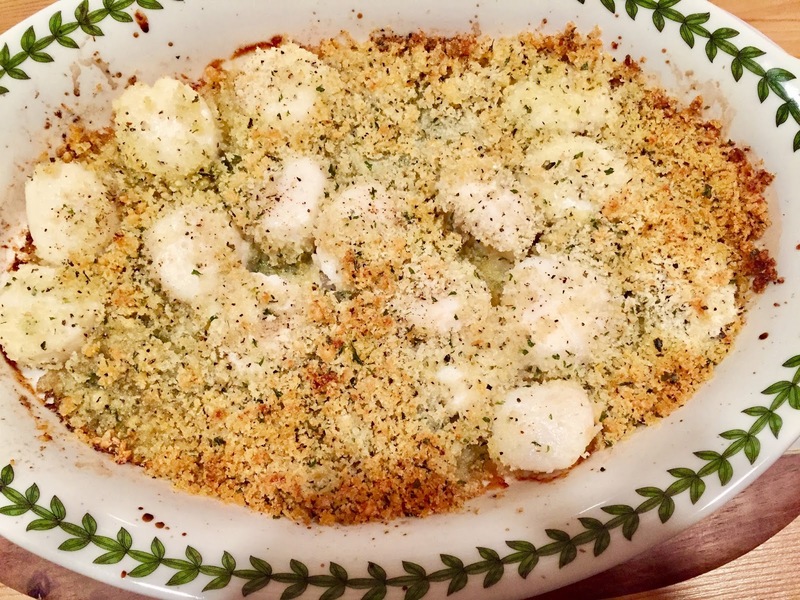 Loving Scallops cooked in a casserole but not always have the time to prepare I created this easy baked scallops for a delicious weekday meal. Prepare the casserole in the morning to bake at night having a wonderful fresh dinner in 20 minutes. Preheat over to 375F. Place scallops in a bowl. Squeeze lemon over scallops. Add olive oil, garlic, pepper and salt tossing to combine. Place scallops in over proof baking dish. Combine bread crumbs and cheese. 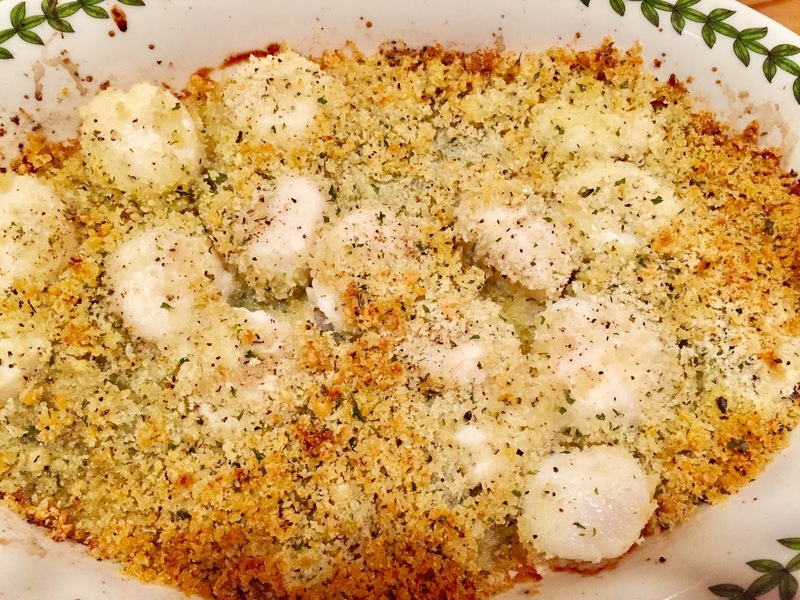 Place bread crumbs on top of scallops. Dot butter over break crumbs. Bake for 20-25 minutes or until topping is brown. Serve over pasta tossed with butter and cheese or rice. Quick and easy delicious meals are a summer staple in our house. No clean up just heat up the grill. Grilling scallops brings out the sweet taste of the sea. All I do is marinate the scallops for a half an hour to enhance the flavor, pick fresh cherry tomatoes, add just snipped basil, so easy, so good. Toss up a salad with fresh farm produce serve along with a wonderfully fresh loaf of artisan bread for the best of summer dinning, so easy, so good. We enjoy dinning alfresco on our deck just relaxing enjoying our meal as the evening sounds fill our backyard with the lullaby of nighttime. Place scallops in bowl. Combine lemon juice, garlic, pepper and salt. Pour over scallops and toss. Marinate in refrigerator for 30 minutes. Heat grill. 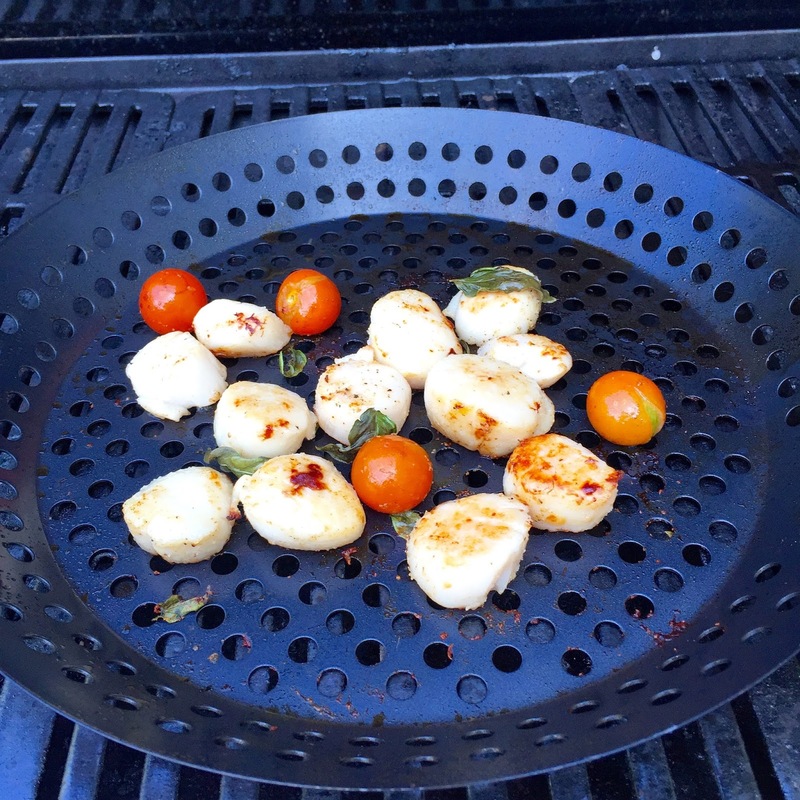 Place scallops in grill pan, add tomatoes and basil. 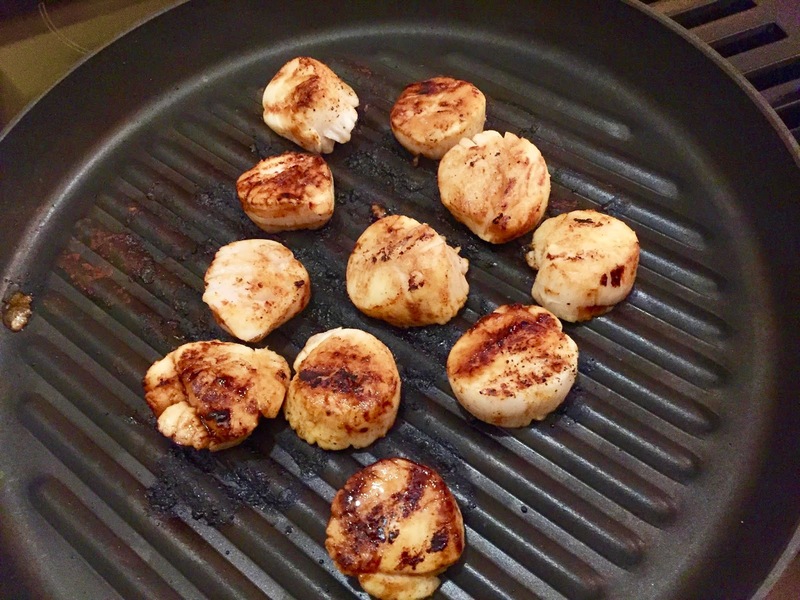 Grill for 5- 8 minutes or until scallops are golden. Serves 4 people. I am always looking for easy, delicious, and quick meals to make for two. Scallops are so delicious and easy to make especially for two people. This is a recipe is quick, simple, spotlighting the sweet taste of fresh scallops. Oh did I mention low in calories! 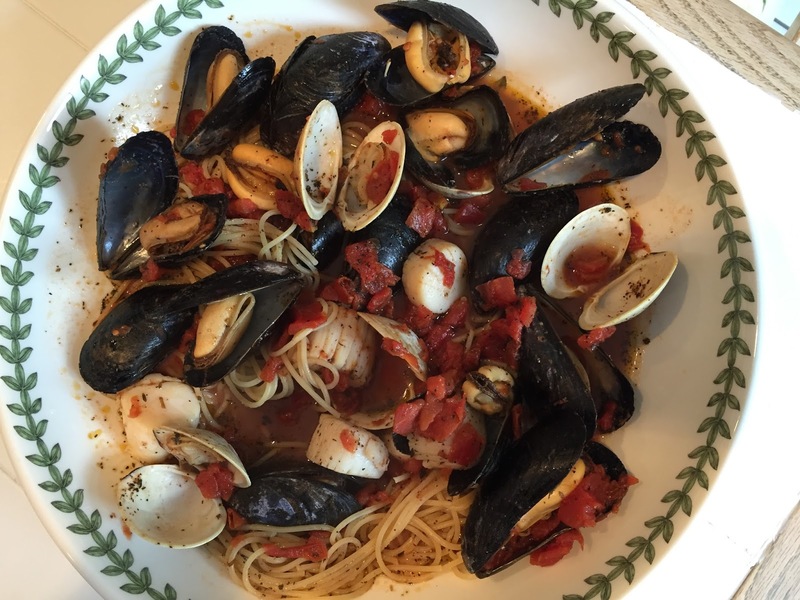 Prefect for a week night when you want something quick and easy, but oh so good!. What to make your weeknight dinner a little nicer? Start with a cheese board, keep it simple. It’s so easy to go to your local market, get two or three cheeses(one hard, one soft and one blue), add some nuts, raspberry jam,prosciutto or salami and crackers. Then serve the scallops with a fresh salad, french bread and a crisp white wine! Light some candles and you have what seems like a special dinner on a weeknight! Rinse Scallops in water and pat dry. In a medium bowl combine lemon, garlic and pepper. Add Scallops, gently toss to coat. Refrigerate for four hours. 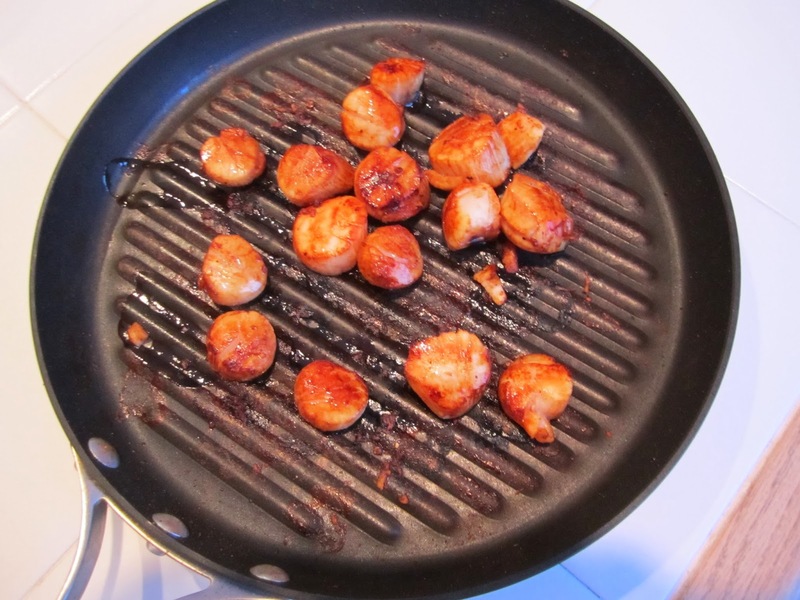 I use a grill pan which I love but you can make the scallops in a frying pan. Heat pan to high, add scallops and sear quickly on both sides. Don’t over cook or scallops will be tough. The scallops will be golden. * Sea scallops are large while bay scallops are small. Heat oil in pan adding garlic and shallots cooking until translucent just releasing the flavors. Add tomatoes, clam juice, Italian seasonings, saffron, salt, black pepper and red pepper. Simmer for 20 minutes stirring occasionally. Add clams, cover and simmer for 5 minutes. Then add mussels continuing to simmer for another 10 minutes until clams and mussels are open. Add scallops combining with sauce, simmer for 3 minutes. While the seafood is simmering cook spaghetti according to package instructions. Drain pasta and put in a large bowl. Add seafood lightly toss. Serve with Parmesan cheese.